Delight your kids with this Classic Collection of Princes Ariel - The Little Mermaid Stationery Kit for Kids and make them realize how special they mean to you. 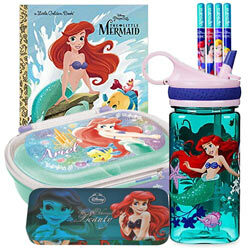 It comes with 1 Lunch Box, 1 Pencil Box, 1 Note Book, 1 Pencil and 1 Sipper Bottle. Flowers Delivery Solan, Send sweets Vadodara, Wedding Cake Bhatinda, Diwali Mithai Cuttak, Send Flowers and Gifts to Pimpri, Online Shop Jamnagar, Flower to Tiruchirapalli, New Year Flowers New Delhi , Fresh Fruits Krishnagiri, Send Gift Kanchipuram, Dry Fruits to Rohtak, Birthday Delivery Madanapalle, Sending to Raichur, Flower shop Varanasi, Rishikesh Online Cake Delivery.